Have you ever had an experience that felt SO important that you just knew you'd never be the same again afterward? That's what this journal entry was for me. At the end of this post, I'll tell you more about the actual impact. But for now, I just want you to know that this entry was a BIG one for me. And that's why I'm sharing it here. Since I wrote this, I've done a lot of thinking (and learning) about WHY this (and other similarly powerful entries) had the impact it (they) did. In other words, I've been asking myself, "What specifically was I doing that may have made the difference?" I'm actually in the process of sharing my answers to that question — spelling out the things YOU TOO can do to create the conditions for a transformational journaling experience. You can find those answers in my online journaling how-to guide. But, as I mentioned in another blog post, I think it's helpful for you to be able to see some specific examples. And so that's what you'll find below. This is a long entry. It took me about an hour of writing and reflecting. 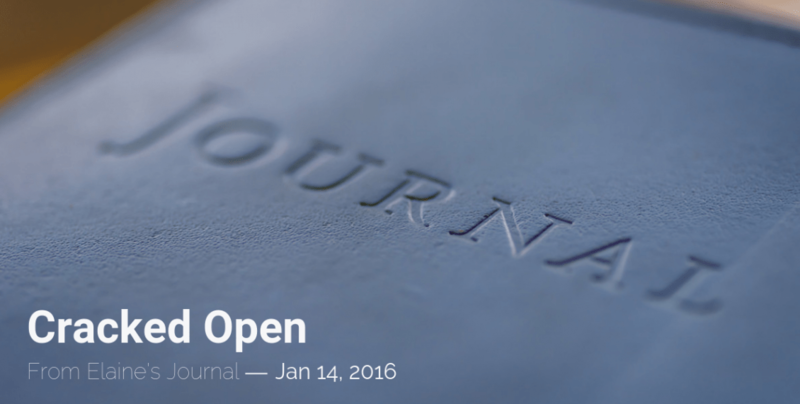 Don't let this scare you off, though, when it comes to your own journaling! A journal entry doesn't have to be this long to have a big impact. I'll be covering the topic of length (and frequency) in that journaling how-to guide I mentioned. But meanwhile, I can also tell you that I spent about half that amount of time on this other journal entry, and it ultimately turned out to be even more life-changing than the one you'll see below. Most Tuesdays and Thursdays, in the very early morning hours, you'll find me tucked away in a nook at the back of a Starbucks here in Richmond, Virginia — sitting across a table from my dear friend Anne. She and I have been journaling partners for about three years now, meeting up before work twice a week to write together. My time with Anne is so precious to me — in part because of our friendship, but also because having this journaling date on our calendars helps hold me accountable for doing this kind of deep inner work at least twice a week. I often use my journal in a variety of ways throughout the week — for setting intentions, learning, planning, working through ideas, de-stressing, etc. — but what Anne and I do together is a true spiritual practice. We start with a little catch-up / check-in conversation — maybe for about 15-20 minutes. Then we choose a focus for our writing. Often it's inspired by our check-in conversation and what we feel we need that day from our journaling. But sometimes one of us will bring a topic, question, poem, or other prompt instead. Or, as you're about to discover, occasionally we find something seemingly random to inspire us. We set a timer for 60 minutes. We put on headphones (with music or white noise) to screen out distractions. 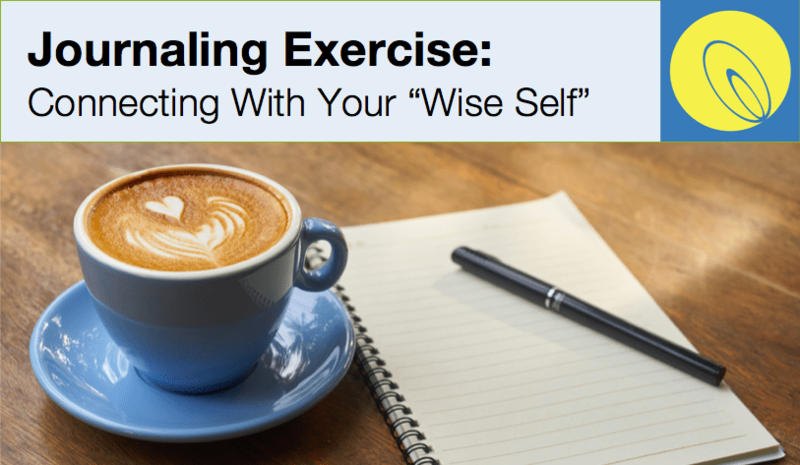 And then we begin our journaling experience, each of us writing silently in our own journal — and often meditating intermittently too, to help take the writing even deeper. After the timer goes off, we take another 15 minutes or so to debrief our writing experience — talking together about what came up for us as we journaled — before we wrap up and each head off to begin our workdays. Our prompt is cracks . . . I think of cracking open, of broken things, of wabi-sabi and the beauty of imperfection. I think of wrinkles, and of childhood superstition in avoiding the cracks in the sidewalk. I think of cracks in one's façade — vulnerability, authenticity, shame. I think of openings. And before moving on to work with these associations, let me pause to record my observations about how much spiritual work happens here at Starbucks on weekday mornings. Our normal table is taken by someone with a Bible spread out in front of him, and he's not the first person I've seen here in that contemplative pose. And I've overheard other spiritual or religious dialogue here while Anne and I have been carrying on our own spiritual dialogues — with each other and with ourselves in the pages of our journals. A small but steady stream of people seems to be coming through this space to "crack themselves open" before starting their days. And there we are. While I was letting my mind free associate and wander, some wise part of me decided that "cracked open" was the particular angle I needed to take on the "cracks" prompt we had started out with. To dig in with that "cracked open" angle, I posed a couple of simple questions to myself that are always fruitful for me: "What does that mean?" and "What would that look like?" So now of course I have to ask myself what that means for me, what it looks like. In some ways, this morning I feel more open, bare, and unguarded than usual. Perhaps it's the interrupted night of sleep, my mind feels so fluid and more connected with dreamlike feelings and imagery, less linear or structured than usual, and it's working for me. But I'm not sure that's the definition of "cracked open”. What does that mean to me? Surrender. Unguardedness. A childlike quality, perhaps, in that there's no protective barrier between me and the world – just wide open experience, curiosity, wonder. Letting myself feel things. That's big. Do I yearn for this? I yearn for the yearning. I remember a more emotional time in my life. It's probably true of all adults — we become more "practical" as we grow old, less magical in our thinking, more inured to life's emotional ups and downs. What prevents me now from inviting this kind of experience back into my being? It's certainly a more powerful way of living and experiencing, and it opens doors to more possibilities. If I were to write the words, "Let me be cracked open today," what would I be asking for? I sat with that question for a good while — eyes closed, doing some deep inward listening to my own heart. ​I close my eyes, and the image, the impulse that comes to me is to fall to my knees, crying. What am I crying about? Or crying for? I am crying, I think, over the adult restraints, roles, & responsibilities that drag me away from this space of pure emotion, pure connection, pure Worship of the Sacredness of Being. Cracked open, then, means no separation. It means nothing keeping me from the pure beauty of the experience I had the day of my archway meditation, nothing keeping me from the heart–soaring feelings I had in my youth when sensing a divine connection with what I then called God's love. And maybe — maybe — I would call it that today too. My language around all this, and even to some degree my beliefs, has been fluid. But the emotions, the sensations, the profound recognition when I am approaching or touching the Sacred, or merely when I'm longing for that connection in its absence — that has been constant and unchanging. Trying to put words to this is really fruitless, but I try nonetheless, because that is in part how I help myself find my way back to the feelings. At that point, I stopped. I didn't have adequate words for what I was talking about, and I was feeling an internal sense of release and resolution. I knew what I really meant by "cracked open". And I knew why it mattered so much to me. So I then did what I usually do when I feel finished with a journal entry. I read back over it to see what final reactions I might want to record. Reading back over this entry, it occurs to me that “cracked open” also means, hugely, letting go of control. You can’t be open and vulnerable and fully experiencing when you are trying to control things, control your circumstances or your own reactions. And as I write all this and read through it, I feel a tightness in my throat and tears that want to well up. What else are they saying to me? What would they have me do? Emotions like that are wise. They can tell you a lot if you're willing to listen. So I closed my eyes and listened inwardly yet again, in a sort of dialogue with the tears. I’ve been closing my eyes and visualizing this for the last couple minutes. It’s hard to articulate well the difference as I picture my “cracked open” interactions during the day ahead, but the best way to describe it is to drop the need to be an adult in the interactions. Drop any professional stance or caretaking stance. You can love the people deeply — Carol, Katya, Dr. H., and of course beloved Anne across the table from me — but that doesn’t mean you have to be anything. Other than be present. Not present in the professional, coach kind of sense. Just Be. Here. Experience. Wonder. Let sacred energy flow through you — without willing it to. Just release. Let emotions bubble near the surface if they want to. And don’t be stymied by the fact that others will still be inhabiting the same world they were yesterday and that you were yesterday. There are no shoulds today. Yes, you will do the tasks you feel it’s important to do — including finishing [Project X]. That’s not the point. The point is the openness you bring to everything. And the memory that you are a living emotional-spiritual being, a glowing core of love and wonder inside what is usually a thick shell of responsibility, pride, and protection. Let that shine through the cracks today! After writing the above, I went through the rest of that day on the most amazing high. I was in love with the world. I felt a sense of deep human connection with everyone I encountered. I was awake, alive, and so open. And when I woke up the next day, it was still there with me — that "cracked open" state of being. In fact, the feeling hung around for many weeks. With no emotional barriers up, I was full of love and curiosity and enthusiasm. I was experiencing my life so much more fully. It was interesting to see how other people responded to me during this time. They seemed to open up to me more than usual. And — as if it was infectious — they too seemed to come alive a little bit more. It was also interesting to watch what happened when life threw me a curve ball. My mom had heart valve surgery a little over a month later, and while she was in the hospital, my dad got sick. Yet I managed to stay connected to my own heart through that whole experience — in a way that made me more loving, more spiritually grounded, and more able to offer myself exactly what I needed during that experience. But 2016 was a hard year for me. My father eventually died that July. And amidst all the health crises and emergency room visits, the home care and hospice arrangements, the difficult conversations and decisions — my "cracked open" state of being got lost. Or, more accurately, I lost sight of it. Because it wasn't gone. That experience had changed me, and it had left me with a sense memory of what it feels like to live that way — and the knowledge of what it takes. And while I've never (yet) completely returned to the cloud I was walking on for those many weeks after I wrote this entry, I've also never returned to the way I was before it either. I've been permanently opened up, heart and soul. What was it about this journal entry that made it so impactful?